There are essentially four types of faults: three-phase, single line-to-ground, double line-to-ground, and line-to-line. Each of these types of faults can result in different magnitudes of fault current. 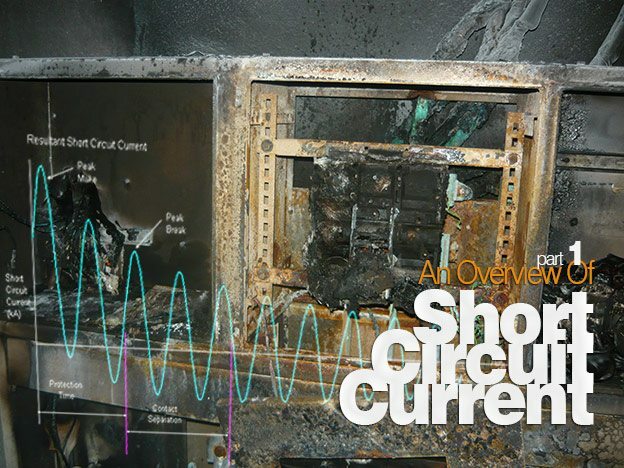 In all types, however, there is a common element: an abnormally low-impedance path or shorted path for current to flow, hence the name short circuit current. Such a condition can lead to extremely high currents. The increase in temperature can cause insulation damage. These currents also produce high magnetic forces, which can actually bend buses in switchgear. High fault currents cause magnetic forces that are proportional to the square of the fault current. The treatment of electrical faults should be carried out as a function of time, from the start of the event at time t = 0+ until stable conditions are reached, and therefore it is necessary to use differential equations when calculating these currents. In order to illustrate the transient nature of the current, consider an RL circuit as a simplified equivalent of the circuits in electricity distribution networks. This simplification is important because all the system equipment must be modeled in some way in order to quantify the transient values which can occur during the fault condition. ih(t) is the solution of the homogeneous equation corresponding to the transient period. ip(t) is the solution to the particular equation corresponding to the steady-state period. α – Φ = ± π / 2, and zero value when α = Φ. Here we introduce the concept of X/R ratio. We can very well see that since ωL = XL or simply X hence DC component of fault current to large extent depends upon Ø = tan-1(X/R) or simply X/R ratio. The X/R ratio is important because it determines the peak asymmetrical fault current. In X/R ratio when X equals zero, there is only symmetrical current with no DC component. With R equals zero, the DC component would never decay. One can say there will always be both resistance and reactive components in the system. The resistance and reactance of a circuit establishes a power factor. The power factor (p.f.) is given by the following equation: p.f. = cos(tan-1(X/R)) this equation means that the power factor and X/R ratio are related. Therefore, system power factor and system X/R ratio are different ways of saying the same thing. Please note that as power factor decreases, the X/R ratio increases. It is impossible to predict a that is at what point the fault will be applied or take place on the sinusoidal cycle and therefore it is not possible to determine exactly what magnitude the DC component will reach. If in a circuit mainly containing reactance a short circuit occurs at the peak of the voltage wave, the short-circuit current would start at zero and trace a sine wave which would be symmetrical about the zero axis. This is known as a symmetrical short circuit current. Right after a fault occurs, the current waveform is no longer a sine wave. Instead, it can be represented by the sum of a sine wave and a decaying exponential. Figure below illustrates this phenomenon. Please note that the decaying exponential added to the sine wave causes the current to reach a much larger value than that of the sine wave alone. The waveform that equals the sum of the sine wave and the decaying exponential is called the asymmetrical current because the waveform does not have symmetry above and below the time axis. The sine wave alone is called the symmetrical current because it does have symmetry above and below the time axis. 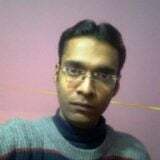 Hence we can define asymmetrical fault current in the following way: If, in a circuit containing only reactance, the short circuit occurs at any point at the peak of the voltage wave, there will be some offset of the current. The amount of offset depends upon the point on the voltage wave at which the short circuit occurs. This is known as asymmetrical short circuit current. Maximum asymmetry occurs when short circuit takes place when voltage is zero. Asymmetrical fault remains only for few cycles after which it becomes symmetrical fault. Decay of asymmetrical component depends on the value of X/R. More the value of R, faster is the decay of asymmetrical fault current. Magnitude of asymmetrical fault current is more than that of symmetrical fault current. If the short circuit current does not include DC component it is called symmetrical short circuit current. If the short circuit current contains DC component it is called as asymmetrical component. Figure above represents the short circuit current with and without DC component. In this article as per equation DC component has two parts,one is sinusoidal part(sin(alpha-phi) and another is exponential part. This DC component can be zero by two ways, one, when sine part is zero and in another way when exponential part is zero.In sine part there is X/R ratio and in exponential part there is R/L ratio that control the DC component. In this article sometimes you have written X/R ratio determine the DC component and sometimes again you have assumed R=0(so purely inductive as per R/L ratio) in the symmetrical or asymmetrical current definition.Means you have considered X/R ratio sometime and again R/L ratio in another time. But you can notice that X/R ratio and R/L ratio is opposite in nature.I am little bit confused with what should we take into consideration X/R ratio or R/L ration in the definition of symmetrical or asymmetrical current. The DC component is a decaying exponential, it must be a function of time. I just wanted to point out that DC component in the differential equation for i(t) is missing the variable “t” in the exponential. Thanks Asif, very good explanation. Looking forward to following parts. sometimes short circuits causes for high temperature or heat then insulation loses and short path made.